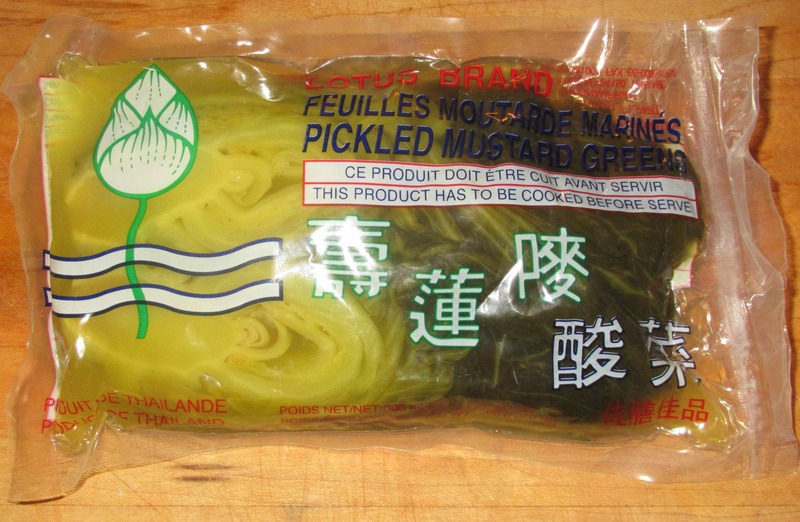 Here you can see the pickle after being removed from the package. The actual vegetable used variety of mustard with botanical name brassica juncea, and known in its fresh state, in Chinese, as ‘jie cai’ (芥菜). I have only occasionally had the non-pickled variety (and only in restaurants thus far) but the flavor is cabbage-like with a distinct pungency reminiscent of horse-radish. Sometime, I would like to pickle some of the fresh article myself and I hoped that we could grow some in the community green-house this season. Unfortunately, my wife was unable to locate any seeds and so that experiment will have to wait for another time. As I mentioned, this brand is quite salty (as are many others), and you are well advised to rinse it briefly and then squeeze out the water before using. Some recipes suggest soaking in ice-cold water as this also helps return some of the crispiness of the fresh vegetable but I wouldn’t do this for more than five minutes or so as you don’t want to lose to much of the lovely pickle flavor. Normally, I would suggest trying Pickled Mustard Greens as a condiment along side other dishes but this particular brand clearly states that it must be cooked before serving. I did try it raw and it is perfectly delicious and tender, but I am thinking that possibly the warning is a hygienic concern due to the type of fertilizer used. Accordingly, I am just going to use it cooked. 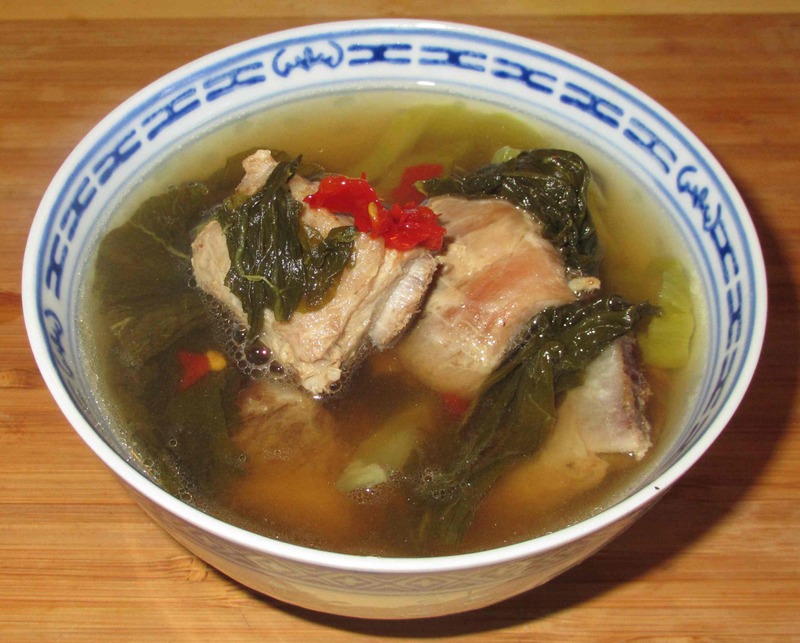 A simple soup, especially with pork ribs, is a very nice dish as you can see pictured above. I had some ribs browned ready for another recipe and I simmered a few with the greens in water with just a dash of soy sauce, and rice wine. For garnish, and a little fillip, I added just a tiny bit of salted red chili. The soup looks really tasty! 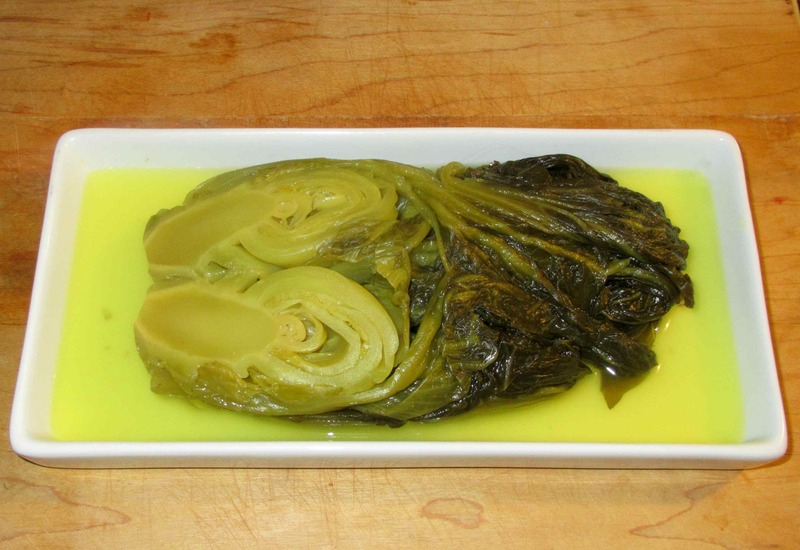 I love fresh steamed mustard greens, and I think pickled sounds interesting! We have so many Asian markets, I’m sure they’re available! Looks delicious! Pickled mustard greens are great to add to soup. At my favorite Sichuan restaurant, they have a pickled mustard green, fish, tofu, and enoki mushroom soup that is wonderful and sounds very similar in flavor to the one you have here. I’ll have to try this one! I came here from your other post with the beef recipe – how interesting! Next time we’re in Bristol (our nearest city) I’ll go to a Chinese shop and have a look for some! I love pickled mustard. You get it everywhere here served as a side dish or snack!